Sleek, stylish and simple, the Misfit Phase is an easy-on-the-eye activity tracker that collects your data without really pushing you to become more active. A great step tracker for those after subtlety, but it won’t cut it for enthusiasts. While Misfit is an established name in the activity tracking space, the new Misfit Phase is the company’s first watch, with Misfit having previously dealt in basic, jewelry-inspired activity trackers such as the Misfit Shine 2 and Misfit Ray. Even compared to other fitness-focused smartwatches, however, the Phase is something different. Instead of a straight Apple Watch 2 or Fitbit Charge 2 rival, it’s a hybrid device, a smartwatch for those who prefer traditional timepiece styling. Building around standard run, swim and cycle-tracking skills, it sacrifices an integrated heart rate sensor and GPS for a clean, uncluttered design. It’s smarter than it looks though, with activity tracking joined by an array of smartphone-syncing notification alerts and wrist-based phone controls. Despite its basic tracking skills, the Misfit Phase isn’t particularly cheap. It's out now, and can be picked up from £165 ($175, AU$246). That puts it in similar territory to the Withings Steel HR and Fitbit Blaze, devices that offer better fitness tracking and more advanced smart skills. What none of its rivals have, however, is the look of the Phase. But is that enough to make you buy it? Most fitness-focused smartwatches are either bland or overly brash – just look at the Garmin Forerunner 35 and Fitbit Blaze. The Misfit Phase, however, is all sorts of stylish, and features a design in which subtlety is key. For the outside world looking in, this is just a traditional watch, and a damn fine-looking one at that. 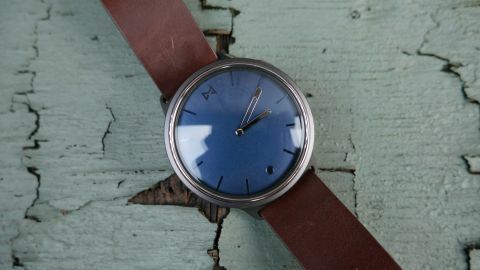 A brushed metal body is paired with a supple leather strap, with just two side-mounted buttons the only thing detracting from its smooth, clean finish. If you don’t want people to know you’re trying to get fit, they won’t. You’ll be able to dodge all the endless questions about how your new fitness push is going, and simply enjoy the anonymity. There’s no LCD display or touchscreen panel here either. Instead, a 41mm traditional watch face provides a clean, classic look that disguises hidden smarts. Press the top button on the watch’s right edge, and the time-telling arms will move to indicate your progress towards your daily step goal. The watch’s face becomes a 0-100% dial, with the 6 o’clock marker indicating 50% of your target activity. Further upping the Phase’s design game, there are six different color and strap combinations to choose from. Covering white, black, blue and gold combos, three come with luxury leather straps and three come bundled with a hardwearing silicone rubber band. While the rubber strap options will set you back £165 ($175, AU$246), plump for a leather band and you’ll end up paying £185 ($195, AU$274). That's not cheap for what’s essentially a glorified step counter. Although it's a stunning bit of kit, the gray-bodied, deep blue-faced model we tested did have a design downfall – it’s not the easiest to read at night. Although the watch’s hands are silver and bright, the hour markings are dull and dark, making getting an accurate time reading in the hours of darkness tricky. That’s the only design-based grumble we had though. The Phase is also waterproof to 50 meters, although you wouldn’t want to take it for a dip without a sports strap. The same can be said for running. We wore the Misfit Phase on a 5K run and although it was comfortable, we found the combination of soft, supple leather and mounting levels of sweat wasn’t the best mix. If you want this as a run- or swim-friendly wearable, you might want to invest in an additional silicone strap, available at $25/£25/AU$35 a pop. It won’t look as nice, but it will definitely serve you better in the long run (or swim).